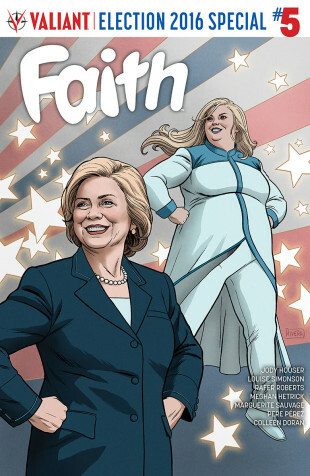 As unveiled today in its entirety at Vox, Valiant is proud to present an advance look inside Faith’s historic first encounter with Democratic presidential nominee Hillary Clinton from the upcoming FAITH #5 election special – in stores tomorrow, November 2nd! Plus: With just one week to go until the historic presidential election of 2016, Valiant is also proud to announce that FAITH #5 – a 48-page election special teaming Faith “Zephyr” Herbert with the first female presidential nominee from a major political party – has sold out at the distributor level in advance of its November 2nd street date and will soon return to store shelves with the FAITH #5 SECOND PRINTING! To meet the astonishing response to one of the most important election specials in comics history – as detailed at BookRiot, Gizmodo, The Hollywood Reporter, Vox, Vulture, The Washington Post, Yahoo!, and many dozens more – Valiant is also taking extraordinary measures to provide participating retailers with a complimentary overship of FAITH #5‘s sold-out first printing that will arrive in stores just in time for the title’s November 2nd on-sale date. Retailers will receive their bonus copies of the FAITH #5‘s sold-out first printing in 50% proportion to their orders of FAITH #5’s Cover A by Eisner Award-winning artist Paolo Rivera. Subsequent copies of the FAITH #5 SECOND PRINTING have also been made available through Diamond code: SEP168575. Packed with 48 pages of all-new content for just $3.99, a major Valiant milestone takes flight right here in an all-star election special for the ages! First, discover the critically acclaimed adventures of Valiant’s most-beloved heroine with AN ALL-NEW JUMPING ON POINT from acclaimed writer Jody Houser (Mother Panic) and rising star Meghan Hetrick (Red Thorn)! 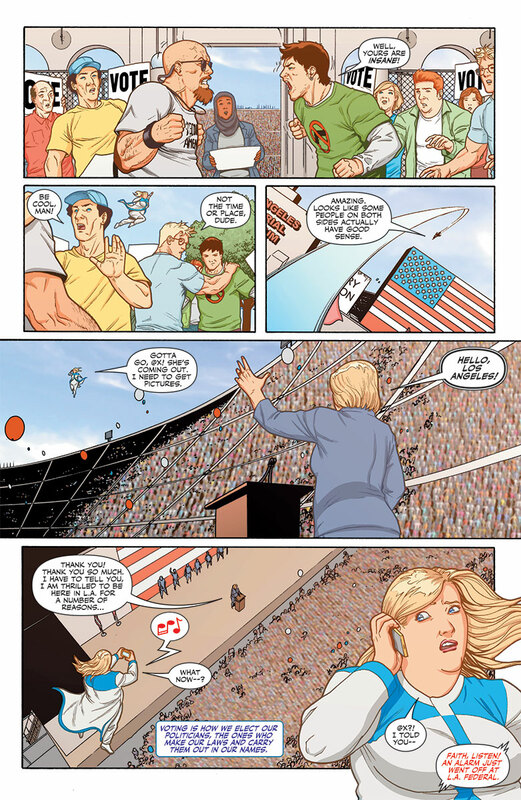 Then, history is made as Faith and Hillary Clinton rock the vote in a timeless election special tale that only comics legend Louise Simonson (Superman: The Man of Steel) and acclaimed artist Pere Perez (HARBINGER WARS) could tell! And last, but not least, don’t miss a special prelude to HARBINGER RENEGADE #1 – the biggest, most important Valiant debut of 2016 – in a special story from multiple Harvey Award nominee Rafer Roberts (Plastic Farm) and Eisner Award winning artist Colleen Doran that won’t be found anywhere else! Faith Herbert, star of the highest-selling independent superhero debut of 2016, is a shining beacon of optimism in a challenging world. 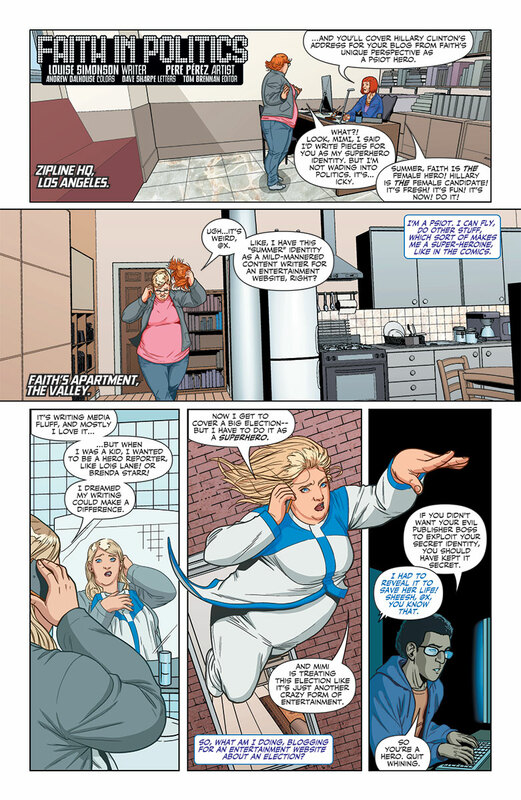 Her day job as a blogger and journalist is about to bring Faith face to face with Democratic Presidential nominee Hillary Clinton…but its her daring alter ego as Los Angeles’ leading superhero that will have to save the day when a new threat emerges to imperil a pivotal moment that has all of America watching! Faith is leaping off of the comics page…and into the annals of American history! 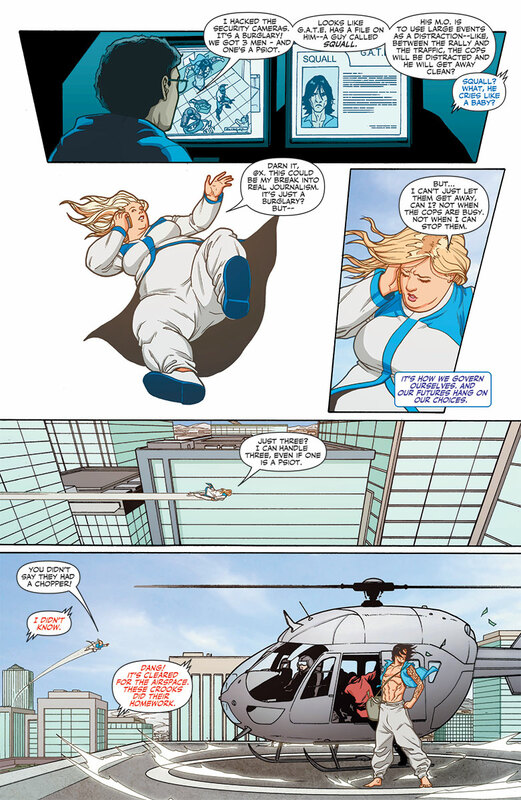 On November 2nd, Valiant’s sky-soaring hero takes flight with Hillary Clinton in the most spectacular election special ever told, only in the sold-out FAITH #5 – returning to stores on November 23rd in the FAITH #5 SECOND PRINTING! SNEAK PREVIEW: FAITH #5 – ON SALE NOVEMBER 2nd! READ THE COMPLETE STORY AT VOX! FOR THE REST, READ THE COMPLETE STORY OF FAITH’S HISTORIC MEETING WITH HILLARY CLINTON FROM TOMORROW’S FAITH #5 RIGHT NOW AT VOX!